If our bottom line is to deepen our impact for the communities that matter to us, every minute counts. How do you prioritize your weekly digital tasks for optimal performance? During our internal tri-weekly SCRUM (an Agile framework for getting projects done), each Fifty team member provides an update on what they’ve accomplished, what they’re currently working on, and what they plan to complete – including any dependencies that may constrain timelines. We assess priorities across multiple parameters: client needs, time required for task completions for the design, technology, and content departments, backlogs, and team member availability and schedules. We’d like to share a simple tool and process to figure out how to prioritize your projects smartly, efficiently, and consistently – all with buy-in from internal stakeholders. 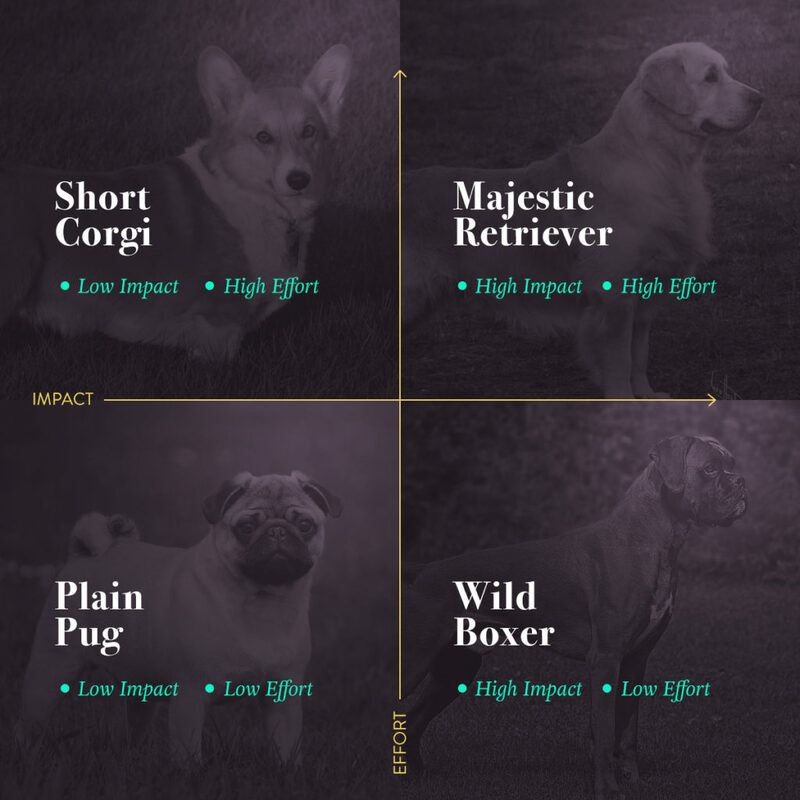 We call it the Impact Quadrant. Our philosophy with project management is simple: Focus on delivering impact while assessing against multiple constraints. Whether you use Asana, Basecamp, Trello, Jira, or any other project management tool, we’ve found that visually plotting and seeing your tasks on a quadrant tremendously helps. Let’s get into it. Build out a list of tasks by project for your next sprint. Carve out an hour with your internal project stakeholders. It’s crucial to have the right people in the room (not just for heterogeneity of thought and opinion – although that matters -), but to have them dictate thought. Managing expectations so every team member agrees to the importance, impact, urgency, or level of effort of a given task is crucial to the health of both your team and users. Impact: Rate the level of impact on a scale of 1 through 10, from lowest level of impact to highest level of impact. Consider these points along the x-axis. Consult with your colleagues for agreement and buy-in on a reasonable rating. Level of Effort: Rate the level of effort on a scale of 1 through 10, from lowest level of effort to highest level of effort. Consider these points along the y-axis. Consult with your colleagues for agreement and buy-in on a reasonable rating. Plot the coordinates on the quadrant below. Determine task priority starting with highest impact and lowest level of effort (Quadrant 4), then shifting to the center of the graph (or Quadrant 2, depending on your needs). The Impact Quadrant: Be the Boxer. Always be the boxer. Use the Nonprofit Impact Quadrant to assess your weekly digital project needs. You can also extend the grid above to a three-dimensional view by adding another parameter: Urgency. Urgency can be defined in different ways, but we’d like to think of it in terms of either client demand and/or timetable. You’d simply incorporate a z-axis and perform a similar rating from 1 through 10. Because the above works best in short-term sprints, you can easily miss the bigger strategic pieces of the project. Always make sure to evaluate from a bird’s eye view and assess performance delivery against your company objectives. Good implementation requires both cultural and technical changes within your company. As with any organization, nonprofits have to adopt new ways of thinking about projects to deliver the greatest impact to their communities. The tasks with the most impact and least level of effort may not always be the most important ones, especially when you bring other priorities into play. What other parameters are crucial for your project management. If you haven’t done so already, take the Impact Quadrant for a test drive with your partners. Share the quadrant with your colleagues or print it out as a neat little reminder (or to decorate your desk, whatever works).